Today I am going to attempt to help you figure out how to cut and buy the correct amount of fabric for the back of your quilt. This will be featured in the tool section as Backing Chart for quick reference in the future. This chart assumes your fabric is 42 inches wide. You will have to make adjustments if your fabric is a different width. 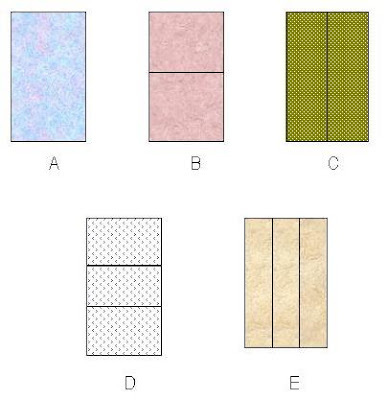 This first section will feature five different options for piecing the backing depending on how big your quilt is for the optimal use of fabric. I did do the drawings below, but someone else figured out the math, and I am not sure who to give the credit to, as someone gave me these numbers. OPTION A: No piecing. Just cut to size. OPTIONS B AND C: Cut the backing fabric in half crosswise (selvage to selvage), removing the selvage first and then sewing the two pieces together lengthwise on the long edges. 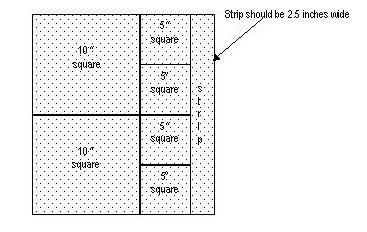 OPTIONS D AND E: With this option you cut your fabric in thirds crosswise again, (selvage to selvage). Sew the three pieces together lengthwise along the long edges. I hope this was helpful to you. I have a printable document in the tool section for you to take along to the quilt shop here. Thank you for this helpful tool! I have printed it for future reference. May I post this chart in my guild newsletter? Yes, you may use this to.post.